We own a beautiful, two-bedroom, two-bath condominium in Turtle Cove on Kiawah Island that is rated as 'top tier' (premier level) by Kiawah Island Resort. Our rates include full Kiawah Island Resort privileges, including FREE use of resort pools, access to the fitness center, door-to-door van service to take you anywhere on Kiawah Island, and resort benefits for golf tee times, bicycle rental, canoeing, kayaking, kids camp/activities, nature outings, etc. This is an upper unit, bright with vaulted ceilings. It has been recently renovated and includes an enclosed sun room with wooded views. There is a full-size washer and dryer and a wet bar. There are three wide-screen LCD TVs and DVD players (including a home theatre system with iPod docking station), a sleeper sofa, game table, and work area with fold-out desk. The sun room also has its own seating area. The kitchen has been recently remodeled, including granite countertops and stainless steel appliances. Both bathrooms were also remodeled, including granite. It is a short ten-minute walk to the beach, and is also minutes away from the tennis club and East Beach Center, with a small food store and restaurant. The new Turtle Point Golf Clubhouse is just down the road, with an excellent restaurant. The Sanctuary Resort is within walking distance, with its distinctive dining opportunities and boutique shops. There are more than 20 miles of bike paths to explore, and Kiawah Island is a paradise for golfers and tennis players. Our guests have use of the Kiawah Resort pools, including 2 (Night Heron and West Beach) that have both lap-style pools and family pools, complete with water slides and other activities. We are Glenn & Jan Pearson and we live near Boulder, Colorado. We have been coming to Kiawah for 25 years; it provides a perfect contrast to the mountains here in Colorado. Our two children, now grown, particularly love going to the beach and bicycling the beautiful bike paths. Kiawah has been, and will continue to be, a very special place for us to escape to and relax. Kiawah has always been a special place to visit for our family, with its extensive, uncrowded beach, great restaurants, bike paths, and general resort atmosphere. Its proximity to Charleston is a real bonus; there is so much history and sightseeing nearby, and Charleston is known for its low-country cuisine. Kiawah is our daughter's (now grown) favorite place on earth. Our guests are considered guests of Kiawah Island Resort, and, as such, have access to resort amenities, such as use of resort pools and preferred tee times at the golf courses. Turtle Cove is within walking distance of the Sanctuary and East Beach Village, giving our guests close access to various restaurants and a small grocery store. Turtle Cove is the furthest east condominium complex, meaning the beach closest to our condo is uncrowded, being near the Vanderhorst Plantation part of the island. The resort rents kayaks at nearby Mingo Point. Bicycles available for rental from numerous agencies on and around Kiawah Island. Kiawah has great bicycle paths all around the island. Charters are available at Bohicket Marina, just off Kiawah Island. Top-ranked tennis resort in the world according to one tennis publication. East Beach tennis club is a short walk away. Kiawah and golf are synonymous; the PGA was held here in 2012. There are 5 courses open to guests. Full-size Washer and Dryer. 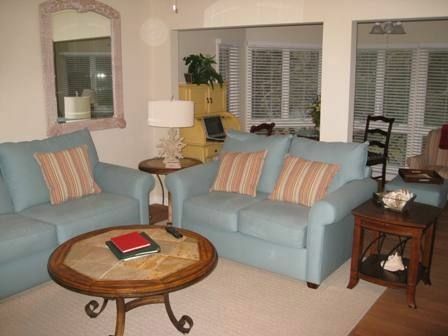 Our condo has been ranked as top-tier by the Kiawah Resort, also known as Premier Level. This Turtle Cove Villa had everything we needed! Perfectly located on the Kiawah Resort. Close to the beach, golfing, biking, and the Sanctuary! Very Clean and has washer and dryer. I would highly recommend. Beautiful location and such a comfortable space! Our only complaint was the workout/fitness center was not optimal, most of the machines were broken and it was extremely small with a super unpleasant odor, and difficult to find. We were treated quite harshly at the Sanctuary when we requested to use that facility (in 2 days, only 6 people had signed in on sheet and it was completely empty both times we stopped by) by a gentleman [Jim]. Thanks for the review. The fitness center is in the process of being renovated/moved to a new location, but it will take awhile to accomplish this. It's part of a master plan by the Resort to centrally locate some of the amenities. I will pass your comments on to the resort management. We hope the rest of you Kiawah experience went well. This space exceeded our expectations. It was way roomier than we expected from the photos. Perfect for our family. The kitchen was fully stocked with all of the utensils and other cookware that we could have needed. Location was great. We had a couple maintenance and minor housekeeping issues that the resort took care of right away, but nothing that detracted from our enjoyment of the space. The owners were very communicative, and we look forward to renting from them again. This villa is truly exceptional in every way: gorgeous kitchen and bathrooms, beautiful furnishings and decor, plenty of kitchen utensils and cookery to prepare meals, great internet and cable provided. The overall appearance of the villa is well-maintained and super clean. We loved the location within Kiawah. We are typically hotel snobs and this villa exceeded our expectations and made for a delightful vacation!!! Thanks for the kind words Lisa. We are proud of our place and love sharing it with other guests. We hope to see you there again! I was seeking a comfortable property near the beach with lots of recreational opportunities, and this one certainly met my get-away expectations. I was traveling alone; this spacious condo would nicely accommodate a family, with its open ambiance in the large living room that separates the two sleeping and bath areas. The sofa and love seat, accompanied by a huge coffee table are a great place to kick back and watch the large flat screen TV. The second bath has a door to the hall as well as the Twin BR. The king bed in the master has rather firm mattress, but pillows could use luxury revamp. Preferred 2nd bathroom to the master, as felt more spacious. Shower pressure great; 100% cotton comfy towels. Location of the villa is corner of Green Dolphin Way and Turtle Point Ln in very shaded building. Usually a light worshiper, I was soothed by the muted forest contrast from the brightness of the beach. Front bike racks to park your Kiawah bike rental, which can be ordered for direct delivery to your villa. Recommend rental for your entire stay! Be sure to include basket in your order for only $3 /stay. Arrived day after Hurricane Hermine affected area with gusty winds, and there was foliage down everywhere on the island. While the staff was cleaning as fast as practicable, it will take weeks to remove. Biking to beach access ramp trail #27 that borders the eastern side of The Sanctuary took 3-4 minutes, then 3 min to the bike racks, then 2 min walk across the wooden access ramps above the shrubbery and dunes. I don't see how it would be a 10 min. walk, particularly with small children and beach gear. As your marked parking pass is for villa space, there's not much of an alternative other than a driver dropping off others and taking bike back. You can also walk your bike onto beach itself, where at low and mid-tides, you can enjoy the most phenomenal experience of riding miles on a flat expanse of beach, even into the surf a bit :) Night Heron only Pool has 25m lap markings in 3 lanes, but go early, as families fill those areas 10-4. Water park for tots, except slides. Resort access HUGE + for this property. Kitchen well-equipped; no bug/gator/snake sightings were made; Nature Center is cool. Skip beach yoga; competes with AM maintenance. Sanctuary toy store & Fresh Fields Bookstore have great gifts. Go to Straw Market, Freshfields, or Harris Teeter for ice cream, as Sanctuary has obscene prices. Bobcats live far west end of island near river. Thanks for the kind words. We will check into the pillows on our next trip. There is a slightly faster route to the beach, but I must admit I am a pretty fast walker, hence the 10 minute estimate. Hope to see you again on a future trip to Kiawah Island! I can't say enough wonderful things about this property. This condo truly was like a home away from home. The attention the owners have paid to detail makes all the difference. We loved the layout of the condo. Tile floors made it easy to keep things clean in the entryway and bathrooms after a visit to the beach. At the end of a long day the soft couches and wooden floors in the living room felt like home. And the bedrooms were perfect -- comfortable beds, soft carpet, and plenty of sheets and pillows. The kitchen offers everything you could possibly need -- plenty of cupboard, cabinet, and pantry space; a super nice fridge and dish washer; all the appliances, utensils, dishes, and cutlery necessary for preparing meals. The sun room is a great place to sit, relax, and read. The washing machine and dish washer worked well, and housekeeping was happy to provide additional clothes detergent and clean towels as needed. If you hit a rainy day like we did, there are plenty of books and board games to choose from. Will definitely plan to return here in the future! Thanks so much for the kind words. We take pride in our villa, and really appreciate this feedback. #1 tennis resort world-wide according to one tennis publication; 5 golf courses to choose from including the Ocean Course, home to 2012 PGA and 1991 Ryder Cup; top family resort as voted by Travel & Leisure magazine, top golf resort in US by Golf World magazine. Rates subject to change. Full refund if reservation cancelled more than 30 days in advance.